Create stunning dashboards across your enterprise. Combine EnvisionWare visualisations and reports with information from your ILS, accounting system and other data sources. 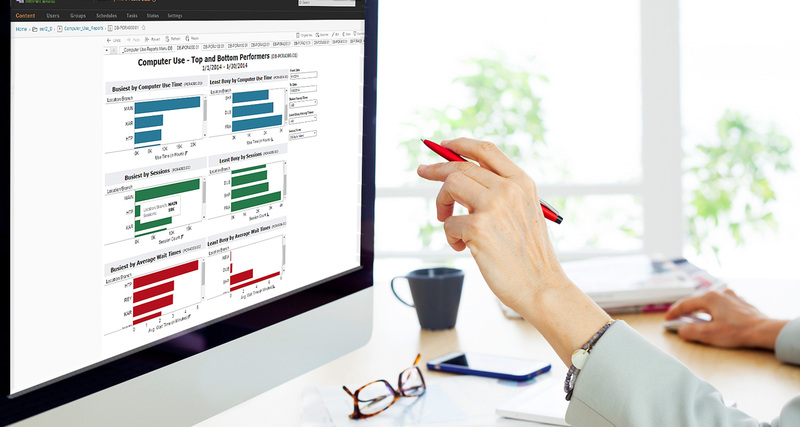 EnvisionWare® Enterprise Reporter™ is a revolutionary reporting tool designed to enable library staff of all skill levels to create stunning visualisations of library data in just minutes. Designed specifically for public libraries of all sizes, this powerful yet simple Web interface makes library data easy to understand, dynamic and striking for Board presentations, community meetings and daily library management. With Enterprise Reporter, you can connect to the entire EnvisionWare data enterprise, as well as to other non-EnvisionWare data sources to view the patron experience from when they walk through the door to their latest transaction.